With heavy hearts our family announces the passing of Lionel, our Beloved Father, Loving Husband and Grandfather, on August 28, 2018 at the age of 88. He leaves behind his loving wife Gloria of 68 years; children Gloria (Jim), Valerie (Bill), Donna (Brad), Larry (Tammy); numerous grandchildren and great grandchildren; and sister Jessie. A Funeral Service will be held on Tuesday, September 11, 2018 at 1:00 pm at St. Pius X Catholic Church, 1077 Fuller Avenue, Kelowna with Father Gerald officiating. Should family and friends so desire, memorial donations may be made to the Society of Saint Vincent DePaul, 2629 Richter Street, Kelowna V1Y 2R3 – www.ssvpokv.ca, or The Salvation Army, 1480 Sutherland Avenue, Kelowna V1Y 5Y5 – www.kelownasalvationarmy.ca. 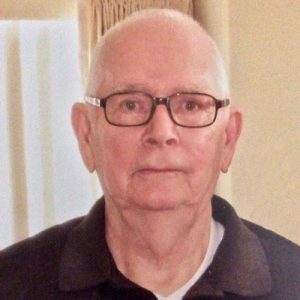 The service for MOYER, Lionel Cecil Frederick is scheduled for Tuesday, September 11, 2018 at 1:00 pm. Below you will find the map for the service location and the contact information should you have any questions. Our Very Deepest Sympathy! Lionel & Gloria were GREAT PEOPLE and NEIGHBORS and we miss them.